Everyone knows that breakfast is the most important meal of the day and waking up your taste buds with some delicious food is top of our priority list on a morning! To help aid any brekkie-block, we’ve put together some nutrient-packed, high protein and easy to make vegetarian and vegan breakfast recipe ideas. So you’re a vegan but maybe you want a full english breakfast with something scrambled… have no fear! It’s actually possible to scramble tofu to gain the same texture. If you want the perfect scrambled tofu, consider freezing it to get a softer and crumblier texture. Luckily, we have a handy how to guide for freezing tofu. You can’t have a full english breakfast without sausages, but you can have them without sausage meat! Luckily, there are plenty of vegetarian and vegan sausages and we here at Cauldron provide some very tasty ones, if we do say so ourselves! 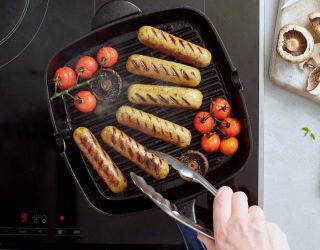 Whether you prefer them fried or grilled, we have vegan sausages that can be found in our frozen range, as well as our fresh vegetarian sausages that are fit for the perfect vegetarian full english breakfast. The classic british full english is often accompanied by a potato side like hash browns. 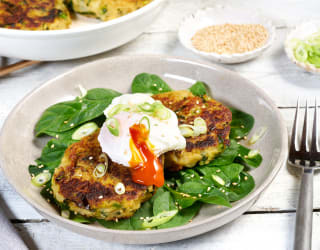 You can create home made hash browns, but if you’re feeling a little inventive, why not try adding bubble and squeak? The classic potato and cabbage patty, if you read below we’ve listed a lovely recipe for this that includes falafel. 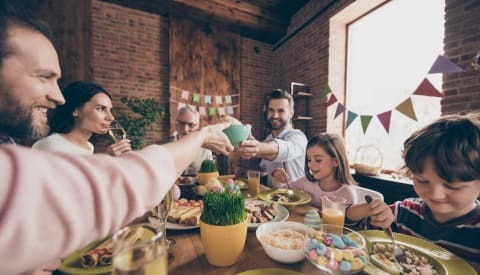 Although beans like Heinz baked beans are actually suitable for vegetarians and vegans, their reduced sugar version is not and some other brands aren’t either. If you want to be sure of what you get with your saucy accompaniment to your full english, why not try making your own? It’s very easy and all you’ll need are drained cannellini beans, passata, tomato puree, brown sugar and spices to flavour! Of course, it’s a no-brainer that any vegetarian or vegan full english breakfast would have some sort tomato or mushroom side. We like to include these in our frying pan when we cook our Cauldron sausages, and especially like to pick up tomatoes on the vine, to give our full english that straight-out-of-a-cookbook look! There are plenty of meat-free full english breakfast alternatives, but what if you’re after something a little healthier? Experimenting with vegetarian and vegan breakfast ideas is a great way to cut out the classic cereal options (which often aren’t very healthy, despite how they’re marketed). There are some brilliant healthy recipes out there, but we’ve taken the liberty of creating our own for especially for the occasion. Who said waffles had to be unhealthy!? We’ve taken a spin on a classic here and created something tasty; they’re light, crispy and filling, the perfect way to start any morning. 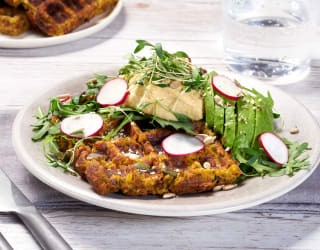 Follow the link below for a recipe but remember, if you’re not a fan of avocado to accompany your waffles for breakfast, you could even pair with roasted vegetable, or a salad of red onions, sprouts and chili flakes. Making a smoothie with tofu may seem strange, but trust us on this one! 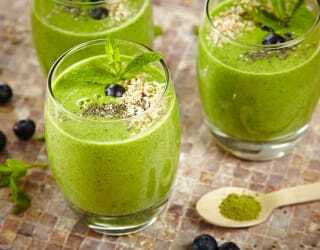 Having a smoothie for breakfast is a perfect way to kickstart a healthy day and the addition of tofu gives you some protein in the morning while also giving the smoothie a creamy texture. This, mixed with the tropical flavours of coconut, pineapple, mango and banana mean that not only is this a lovely healthy breakfast choice, but a good dessert one too! 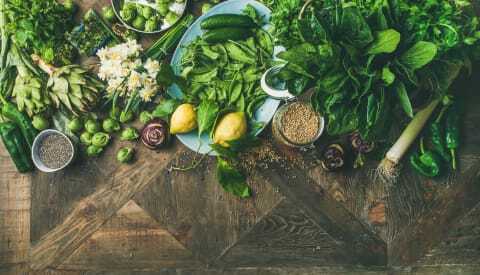 Contrary to popular belief, a plant-based diet supplemented with foods like tofu and falafel can be very rich in protein. However, if you’re transitioning from a meat diet, it can be difficult to know for sure where your proteins are coming from. One of the best ways to set yourself up for the day so you don’t have to worry about it later on, is preparing yourself a vegetarian or vegan breakfast that is high in protein. 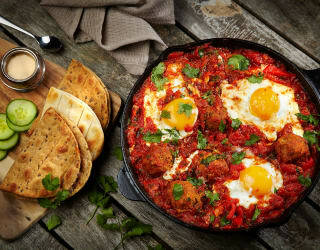 It might seem an obvious choice to include and egg as a high-in-protein choice vegetarian breakfast, but shakshuka is far from ordinary. A dish that’s common through the Ottoman Empire, it’s known for being pull of flavour as well as the perfect thrown-together dish. You can poach the egg in tomato stew itself, not only making it a high protein breakfast, but an easy one too. Our recipe takes only ten minutes to prepare but 50 to cook, so it’s nice to a lazy brunch. 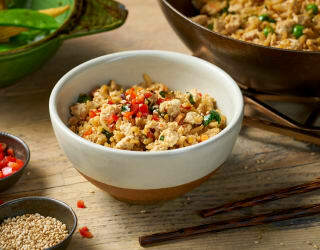 Tofu is the perfect source of protein, as well as iron and calcium; it contains all eight amino acids. What better way than to give yourself a high protein vegetarian or vegan breakfast then experimenting with tofu in the morning. Did you know that it works as a perfect egg substitute when scrambled? 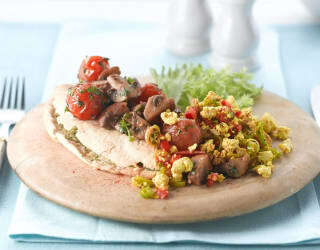 We’ve paired scrambled tofu with mushroom and tomato on pita for a quick and easy high protein breakfast. One of the arguments against a meat-free diet is often that it’s perhaps more complicated or long winded in the kitchen. We think the opposite! Although here at Cauldron we believe taking your time to cook beautiful food is something to be thoroughly enjoyed, we also understand that vegetarians and vegans need quick and easy meals too. We’ve showcased two of our favourite easy vegetarian and vegan breakfasts below. Bubble and squeak is a british breakfast classic that many wouldn’t imagine changing the recipe to. But sometimes it’s nice to add a little more texture to something that could otherwise be quite claggy; that’s what we’ve done here by adding our crispy Cauldron falafels. By crumbling the falafel into the potato and cabbage mixture, you’ll find yourself with a twist on a classic that takes under an hour to prepare and cook. If the weather’s a little warmer, you want a breakfast that’s light and quick to whip up so you can get out and enjoy it while it lasts! 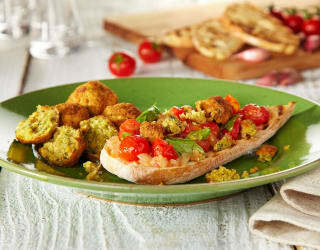 A perfect easy vegetarian and vegan breakfast recipe is something like our italian ciabatta with falafel, sumptuous vine tomatoes and a handful of baby basil leaves. It’s light, tasty and filling and will only take you ten minutes to prepare and cook – less time than a couple of scrolls down instagram before work!